Relyence Reliability Prediction includes a number of features to enhance the data entry process. While reliability prediction analysis is data intensive, Relyence Reliability Prediction was designed to streamline the data entry process. Well designed part forms, data importing abilities, part number look up, instant pi factors, and default data settings all enable you to tackle your reliability prediction tasks with ease. Data entry in Relyence Reliability Prediction can be performed in multiple ways - including direct import from a BOM in Excel. Recognizing that data entry can be a cumbersome task in performing reliability predictions, Relyence Reliability Prediction was designed to overcome this difficulty. 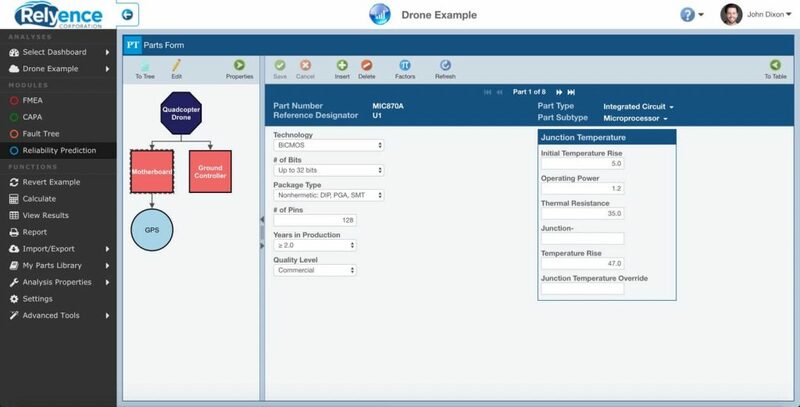 As you add components, you are automatically prompted for the appropriate data parameters, along with the appropriate choice lists, based on the standards you employ. Automatic library searching performs part number look up and data retrieval as you populate your parts list. And, if you desire you can directly copy and paste data from outside sources into the Relyence Parts Table, or even import data directly from a BOM or other formats such as Excel. As you enter a Part Number in your Parts Table, the Relyence supplied component parts libraries and your own custom libraries are searched on-the-fly for part number matches. As you continue to type the part number, the list is continually refined to the matching component part numbers, making it easy to find the exact part your are looking for. 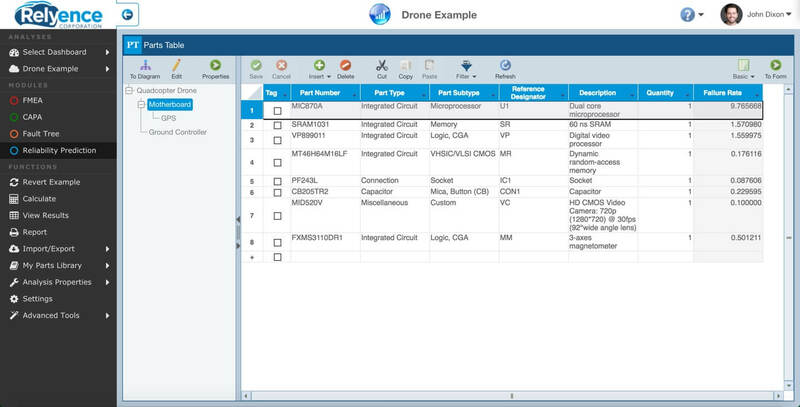 Once you have found the part number you desire, simply select it, and the associated data parameters are quickly retrieved and entered for you. Or, as you import your BOM into Relyence, the Relyence supplied component libraries and your own libraries are quickly searched for matches, and the corresponding data parameters are automatically retrieved during the import process. Relyence Reliability Prediction includes a component library containing hundreds of thousands of parts from known manufacturers. The library allows you to quickly and automatically pull in the appropriate component parameter data for quick prediction analyses. You can augment this built-in library by creating and adding components to your own parts library. Part Libraries, both Relyence supplied and your own custom ones, aid in data entry and efficiency. With built-in, customizable default values, reliability predictions can be performed with a minimum amount of data. 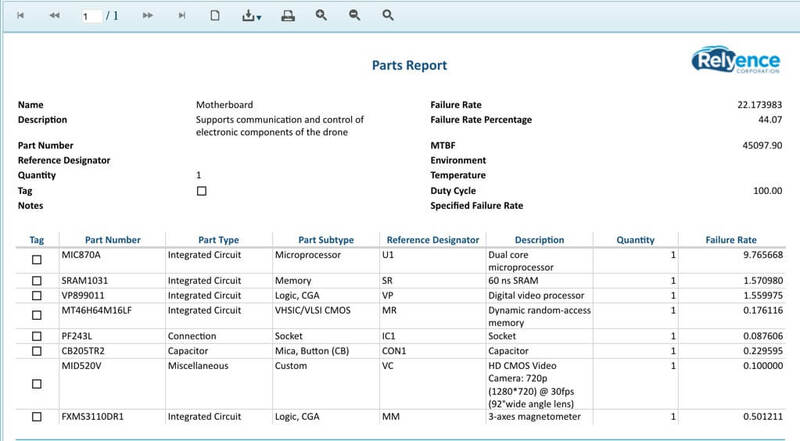 When entering your parts in Relyence Reliability Prediction, you are not required to enter every data parameter. For any data values not filled in, the Relyence Reliability Prediction calculation engine automatically uses average default values to compute failure rates to provide you with a median assessment of failure rate. As you acquire more information, you can continually update the part data parameters for more accurate failure rate calculations. Relyence makes it easy to view the default value for any data parameter – hover your mouse over the label to bring up the tooltip to display the default value. Also, if you prefer to use your own default values, you can set your own default values for particular parameters. You can choose your own defaults for each and every value, or just for a few if you desire. When calculating, Relyence will first check for your own custom default values, and then check for the Relyence built-in defaults. Oftentimes, reliability predictions are a process. As your design evolves, you have more design parameters and operating values defined. Relyence Reliability Prediction is built to handle this ongoing evolution: start with as much or as little information as you have. 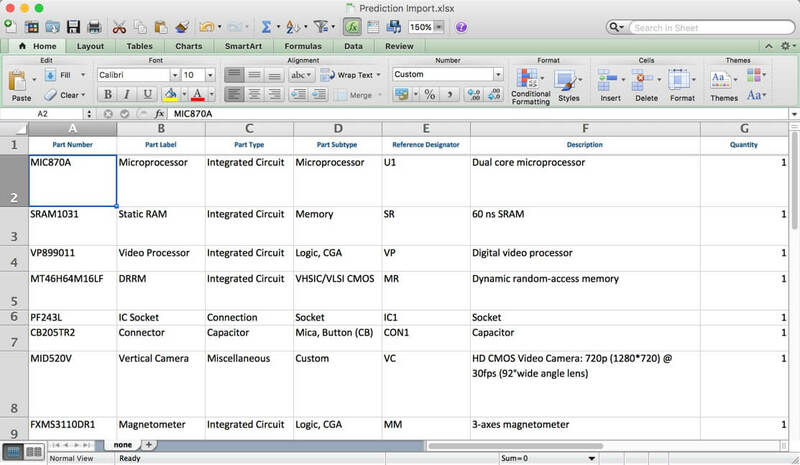 Then continually augment your prediction with known parameters as your design solidifies. One way this can be accomplished is by starting your reliability predictions using the Parts Count methodology. Using Parts Count models, minimal information is required and average operational values are assumed to complete failure rate calculations. When ready, you can then move to the Part Stress methodology which requires more data parameter inputs and results in a more accurate prediction analysis. With Relyence Reliability Prediction, this evolution is easy accomplished: simply select the Parts Count model to start your analysis, then switch to Part Stress when you are ready. Moving from a Parts Count prediction to full Part Stress analysis is done with ease using Relyence. 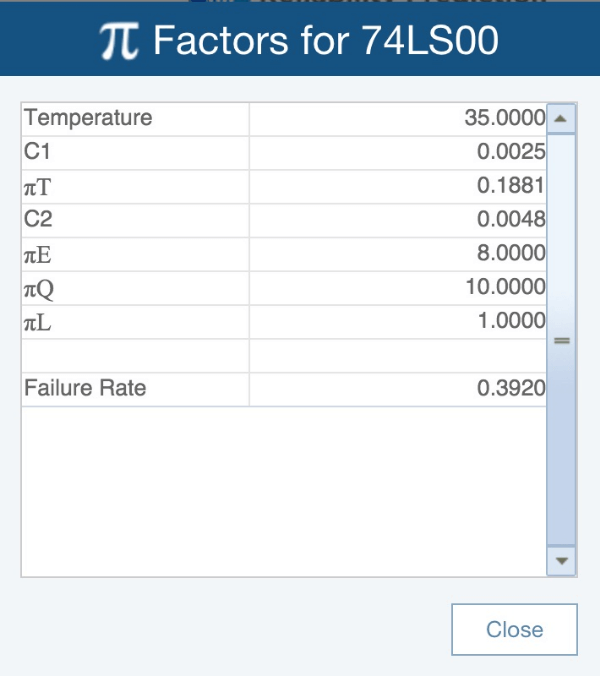 Relyence Reliability Prediction allows for quick viewing of part pi factors. When evaluating the reliability of your components, sometimes you want to see what factors more heavily influence your failure rate values. Relyence Reliability Prediction’s instant pi factors feature provides that insight. 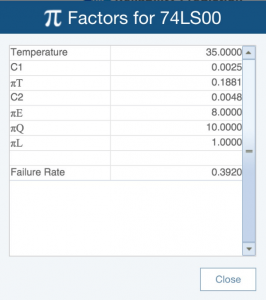 As you are entering your data, you can check the resulting effects on the pi factors, which ultimately reflect in your failure rate and MTBF values. You can also generate output reports with full pi factor details so you can effectively assess those areas that most impact your reliability metrics.